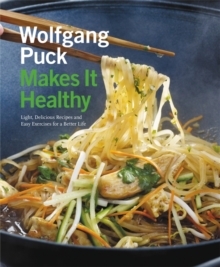 Acclaimed chef and restaurateur Wolfgang Puck shares his classic recipes made healthy along with easy exercise moves to help readers lose weight and feel energetic. In WOLFGANG PUCK MAKES IT HEALTHY, Wolfgang Puck shares the food and fitness plan that helped him transform from being overweight and out of shape to fit and energetic. Now, he offers more than 100 health-conscious recipes, some modified classics from his earlier classics; others brand new. Readers will find flavorful food for every meal, including snacks and desserts, inspired by Mexican, Asian, Italian, Indian, and French cuisine. Puck will never tell readers that they can't enjoy a glass of wine or to cut out their favorite foods. Instead, he partnered with trainer Chat Waterbury and journalist Lou Schuler to outline an exercise solution. They've uncovered a plan for the fitness-phobic out there who want to be able to indulge a little: an adaptable 40 minute workout program focused on core stability, cardio fitness, and mobility that can be adapted to suit anyone's daily life.